[/vc_column_text][/vc_column][/vc_row][vc_row][vc_column][vc_custom_heading text=”Cushion Cut Diamond Engagement Rings” font_container=”tag:h1|font_size:52px|text_align:center|line_height:100%25″ use_theme_fonts=”yes” el_class=”cardo title-mp-remove”][vc_empty_space height=”70px”][/vc_column][/vc_row][/vc_section][vc_section][vc_row][vc_column width=”2/3″][vc_custom_heading text=”Cushion cut engagement rings are unique and stylish. Their elegantly smooth curves are sure to please. 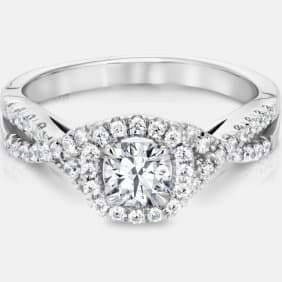 Our team of craftsmen will help you pick the perfect ring.” font_container=”tag:p|font_size:36px|text_align:left|color:%2390856b|line_height:120%25″ use_theme_fonts=”yes” el_class=”cardo title-mp-remove”][vc_empty_space height=”50px”][vc_custom_heading text=”The cushion cut diamond engagement rings on offer:” font_container=”tag:p|font_size:36px|text_align:left|line_height:120%25″ use_theme_fonts=”yes” el_class=”cardo cardo-bold”][vc_column_text]The stylish, timeless diamond cut features large facets that maximize brilliance, and rounded corners that give a soft and romantic feel. Cushion cut diamonds have been popular for hundreds of years because of their enduring sophistication. 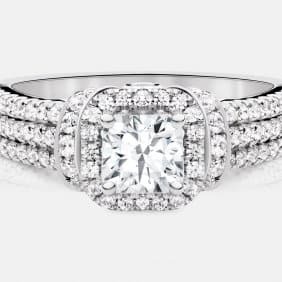 Especially desirable in antique style settings, a cushion cut center diamond is an elegant choice for any engagement ring. Unlike many other cuts of diamonds for engagement rings, cushion cut diamonds have many different types of styles. There are modified cushions, classic cushions, cushion brilliant, chunky cushions, broken glass, crushed ice, no culets, large culets, old minders, square cushions, and rectangular cushions. Many of these different styles are actually quite similar to the standard cushion styles, with only minor changes in how they are cut, leading to small differences in how the stone is viewed. The main differentiation point between the standard cushion and modified cushion variants is the history of the style. However, there are two types of looks that matter. The first is the chunky style of cushion cut. These diamonds are those that have clearly defined facet patterns when looking down into the table of a face-up oriented stone. An example of an attractive band pairing would be a rose gold cushion cut halo engagement ring. On the other side of the visual spectrum are the crushed-ice style diamonds. They do not have any discernible faceting when looking through their table. Instead, what you see is something resembling broken glass or crushed ice. 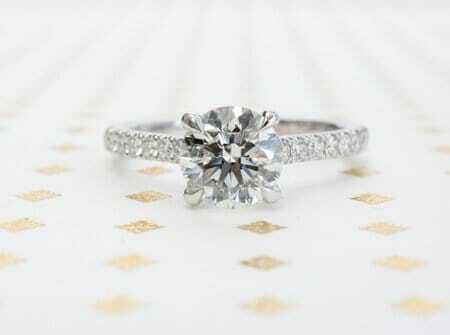 This style of engagement ring is currently going through a popularity spike. This is because the antique style is desirable again. 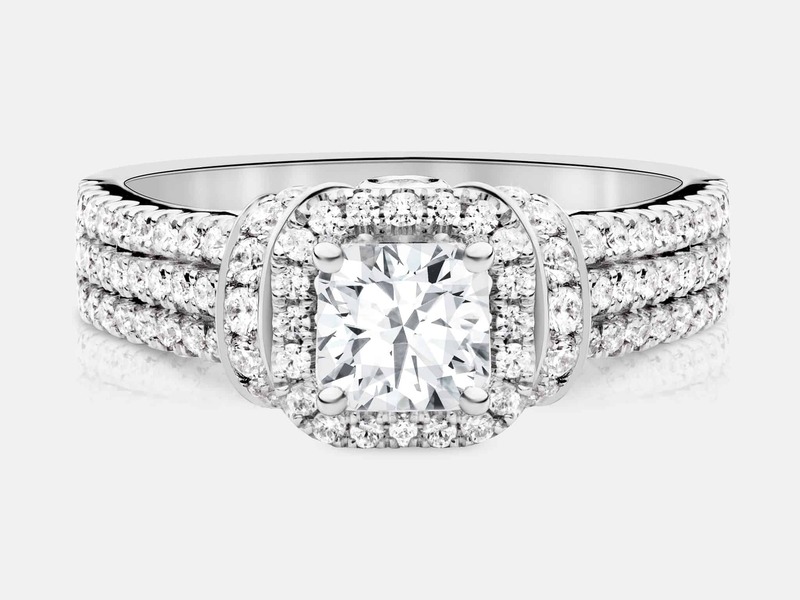 Many celebrities are now championing the cushion cut. 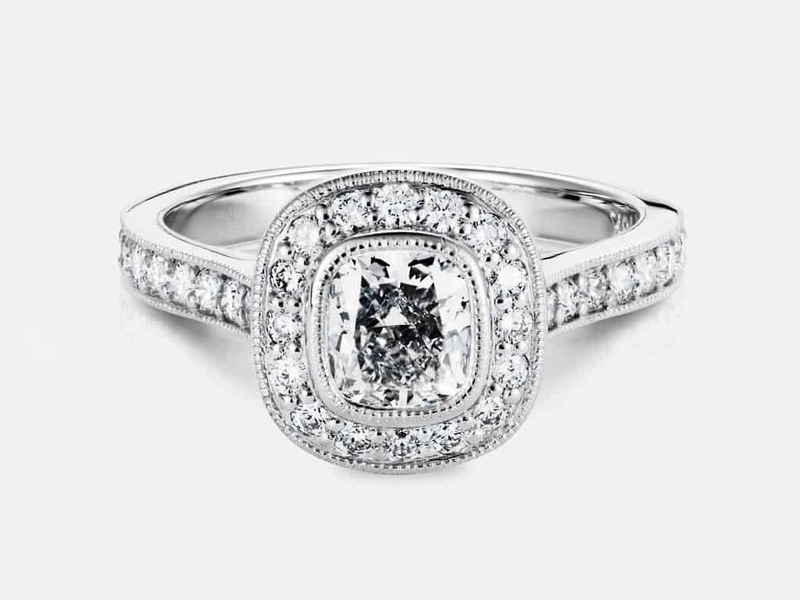 Especially popular are styles such as split band cushion cut engagement rings. A great reason to get a this cut is the appearance. While they are not quite as brilliant as a round brilliant cut, they appear larger. 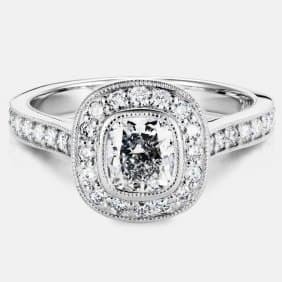 This means you can get a slightly bigger diamond for an equal or even sometimes less cost than a comparable round brilliant cut. In addition, when compared to the round brilliant cut, they are slightly less expensive. However, due to their increase in popularity, demand for these cuts is continuing to rise. As a result, their price is slowly rising. While the this cut may appear to be modern and new, the origin of this gleaming, vibrant diamond can be traced back to the 19th century. Before it became known as the cushion cut, this style was referred to as the “mine cut”, a square diamond with rounded corners. The mine cut was named after the Brazilian diamond mines, which, at the time, were the most common source of diamonds. Later, when diamonds were discovered in South Africa, they became known as the “old mines”. With our years of experience, we know diamonds. When you come to us, you get guided along by our team, who will only suggest the best and brightest diamonds, priced correctly, thanks to our third party valuation. 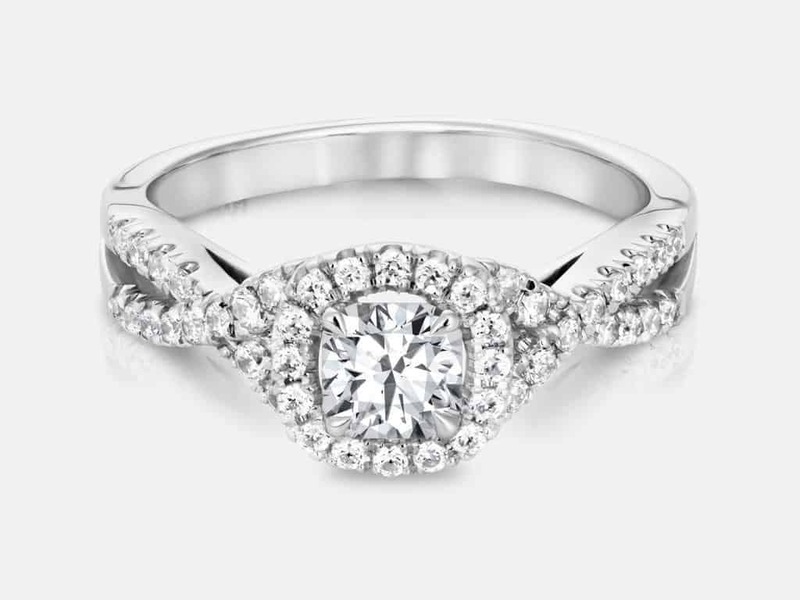 We’ll try to match your desires by showing you different diamonds and rings until you find the perfect one. All of our diamonds and metals, from rose gold, to platinum are responsibly sourced by third parties who share our beliefs and values.